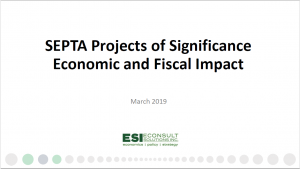 SEPTA: Projects of Regional Significance | Econsult Solutions, Inc.
Econsult Solutions Inc. (ESI) assessed the long-term catalytic impacts of SEPTA’s $6.5 billion package of capital projects. The analysis shows how SEPTA’s projects of regional significance will change the economic trajectory of the region by enhancing regional competitiveness and attractiveness. The projects are anticipated to increase the growth path of the region by more than 50% over a 30 year time horizon, growing the base of regional jobs, earnings and tax revenues. This growth is projected to generate $17.1 billion in additional tax revenues (net present value), a return on investment of 2.6x the project cost. This equates to an annual return of more than 12%, exceeding private sector investment benchmarks.